In early twentieth-century British India, the Pindari leader Prithvi Singh narrates his story to a reporter from the London Times - a story of betrayal and deceit at the hands of the British and Madhavgarh's Raja Gyanendra Singh, which led to the massacre of 4500 Pindaris. 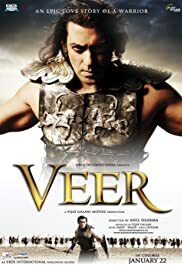 I really liked the Salman Khan film "Veer", and actually was convinced the plot was quite original, until I learned as usual, it's yet another Bollywood version of an older English movie. The 1962 "Taras Bulba", starring Yul Brynner and Tony Curtis, tells the same story (with less typical Hindi family drama of course) between the Cossacks and the Poles, taking place in the 16th century: "The Cossacks of Eastern Europe join the Poles to rid the Turks from the Steps of Europe. In return for their aid, the Poles agree to give control of the Steps to the Cossacks. After the battle, however, the Poles back out of their agreement and force the Cossacks into the hills. Taras Bulba, a Cossack Colonel, raises his son, Andrei Bulba to learn the ways of the Poles so he can one day defeat them in battle. In his learning process, however, Andrei falls in love with the daughter of a Polish Nobleman. This twist causes Andrei Bulba to choose between the love of the Cossacks, and the love of a woman, and causes Taras Bulba to choose between the love of his son, and the love of the Cossacks."